ZTE wants you to design its next product with Project CSX — Vote now! It’s the question on every tech lover’s lips, and up-and-coming Chinese company ZTE wants to answer that question in a highly unusual way. The company is crowdsourcing ideas for its next mobile project from the internet and has committed to building and selling that product once a winner has been chosen. ZTE’s Vice President of Technology Planning and Partnerships Jeff Yee is the core driving force behind Project CSX, ZTE’s mission to give the mobile-buying public what they want by asking them to formulate a product idea, and then design it from the ground up. CSX stands for Crowd Sourced X, and the X symbolises the mystery behind the final product, which will be decided by a competition. Once the votes have been cast and the winner selected, ZTE will build and sell the winning product. That’s right. If you’ve got an idea for a mobile product that’s feasible right now — not one with three processors, a roll-up screen, and five-month battery life — here’s your chance to tell a company that not only wants to listen, but will actually make the device if it’s good enough and technically feasible. It’s Kickstarter without the risk, and the opportunity to genuinely influence the direction of a mobile company, and potentially the industry itself. Really. A system to minimize physical interaction with a phone using eye tracking, or a polymer case to stick the device to various surfaces. A wearable device that makes learning a skill easier and more fun. For example, a glove that teaches you to play the guitar through guided finger movement. 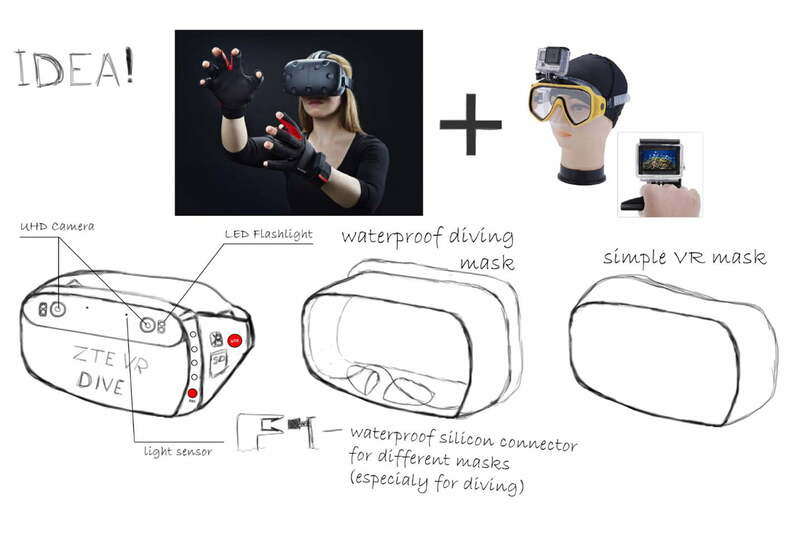 More waterproof gadgets, such as a submersible VR headset to turn a pool into the Great Barrier Reef. Intelligent Smartphone Covers: Expand the power of a smartphone through functional cases such as a gamepad, stylus or e-ink flip cover. Stock Android Flagship Phone: The next generation of Axon to include stock Android as well as improvement in performance and camera. ZTE wants to see what’s called a six-view breakdown — a design term for an image showing the product from six different angles. There needs to be a story attached to the features so the benefits are easy to sell, you’ll need to consider where to place components, what materials are used for the construction, the dimensions, and even an app or device user interface if one is necessary. Creativity and fun come first, and ZTE will guide you through the rest. You don’t have to be an engineer, be able to use Powerpoint or CAD design programs, or know how to code. You can sketch out the product, take inspiration for the materials in the world around you, and get the app’s flow down perfectly without doing anything other than picking up a sketchpad. You may need years of experience to do this professionally, but that’s not true here. Creativity and fun come first, and ZTE will guide you through the rest. You can vote from October 12 until October 19 for the winner using the system below or by heading to the CSX website. Project CSX’s winner will be announced after a series of votes ending on October 19, and the final product will be revealed at the CES tech show at the beginning of 2017. The sale date is the only factor that’s currently variable because it will depend on which product wins. The unusual project is already changing the mentality at ZTE. “The engineers love it,” Yee told Digital Trends, adding that it was the interaction between all teams that he enjoyed the most. “It’s really listening to the customer,” about products rather than just relying on a focus group to fine-tune an internal idea. One of the few rules in Project CSX is that it must be a mobile device. However, mobile could mean many different things. “I want to have a challenge. Something innovative that doesn’t already exist,” Yee enthused. ZTE’s Senior Director of Mobile Devices Waiman Lam had earlier told us he was hoping for something exciting that may use virtual reality or augmented reality. It’s obvious the company really wants Project CSX to birth something exciting, interesting, and innovative. At the moment it’s only ZTE behind Project CSX, but it has attracted the attention of T-Mobile — a network that’s never afraid to push the industry in a new direction — which apparently “loves the idea,” and may want to work on a similar project in the future. For now, though, you could shape the future of mobile with ZTE. Project CSX could go either way. The result may be hugely exciting or terribly lame, but there’s no arguing that ZTE’s current range of phones is extremely tempting. Last year, there were many different Axon phones made for different regions, with different specs. This year there are two — the super Axon 7 and its newly announced, Digital Trends’ award-winning counterpart, the Axon 7 Mini. Both phones represent superb value for your money, have strong spec sheets, some interesting differentiating features, and a delectable design. It’s a big shift from the confusion of last year, in which there were dozens of Axon phones with little to no differences between them. While maturity plays a part in this shift, ZTE has likely been looking at two of its biggest competitors, Huawei and OnePlus, for inspiration. The Axon 7 challenges the OnePlus 3 on price and specs, and comes very close to matching the considerably more expensive Huawei P9 in outright sleek design. ZTE’s Waiman Lam told Digital Trends that the only reason it can beat companies like Huawei on price is that it doesn’t throw outrageous phone launches and multiple press events. We really don’t think it’s a coincidence that this newly streamlined company has not only introduced the Axon 7, easily the best phone it has ever made, but is also running a truly fascinating competition that could end up introducing an entirely new mobile product that we’d have otherwise never seen. The potential, drive, and ambition were always there for ZTE, but it’s all coming together in 2016, and the company has done everything right so far. We’re going to be watching Project CSX and ZTE very closely over the next year, and suggest you do the same. If you want to enter Project CSX, visit the dedicated website here.